There were not many good days for cycling in the first quarter of 2013, so I seized the opportunity on the Tuesday in February half term to escape the surly bonds of Ipswich and head off into the hills to the west and south of town. I'd actually been planning something a bit more ambitious in east Essex, but I hadn't been well, so a leisurely thirty miles or so through the churches of this pleasant area seemed a more sensible rest cure. I headed down the impossibly tiny, hilly lane that runs through Washbrook Street, hurtling down through the woods on muddy roads and praying that nothing would make me need to stop suddenly. The lane that cut down into Chattisham was even narrower and more muddy, so it was with some relief that I came out at the crossroads in the middle of this pretty village. Chattisham is in a twin parish with nearby Hintlesham, and has been for years. But Hintlesham is up on the busy road, and it seems impossible that Chattisham's remote, rural atmosphere can really be barely five miles from Ipswich's urban sprawl. The church has an austere beauty about it. It has been battered and patched up through the centuries. As at Bawdsey, the top half of the tower was removed for safety reasons, probably in the mid-18th century. Because of this, the battlements look curious, although in fact the Decorated west window is an even more recent addition. Red brick work shows through the cement render, enhancing the sense of layers of history. The building has great charm, enhanced by the way the various parts clutter together, and the makeshift repairs have mellowed with age. I'd been here before, several times, and not got in, but nowadays the church is open every day. I turned the handle, and stepped down into the cold hush of an ancient space. There was a good 19th Century restoration here, and probably an 18th Century one before that, but much survives of the previous life of the parish, most notably in the form of memorials. Some of these are in brass on the floor, a good early modern collection. The best is to Mary Revers, the late wyfe of John Revers who had isshue iii sonnes and VII daughters - she died the XII of September anno domini 1592. The inscription is headed on the right by the surviving figure of Mary Revers, and on the left by the ghost of her husband, his figure gone and only the inlay remaining. There is something rather odd about this, because of course the inscription does not mention her husband, only her. Is it possible that the figure is not Mary Revers at all, but that this is a composite, her inscription from elsewhere being added to a surviving female figure whose inscription is now lost? But the nearby plate of mourners clearly shows iii sonnes and VII daughters. Perhaps her husband died and was commemorated elsewhere, but his effigy was still included in her memorial. Another brass inscription remembers John Bennett, borne in this towne, who lived a goodlie and vertuous life therein, by the space of LXXX yeares or more. He died in 1608, leaving sons John and Thomas booth then lyvinge. But the latest is perhaps the most interesting. It commemorates Daniel Meadow, and is dated 1651, which is to say during the English Commonwealth, when the Crown and the Church of England had been suppressed. In Latin, it notes that 'here in this tomb are deposited the mortal remains of Daniel Meadow, born at Rushmere Anno Salutis 1577'. Anno Salutis, 'the year of salvation', is an interestingly puritan form of the more common Anno Domini, 'the year of our Lord'. Found occasionally in the 17th Century, it fell into disuse during the 18th. The inscription goes on to tell us that Daniel died in Chatsam (ie Chattisham) in the 74th year of his age. The inscription continues Dum coelum evolat festinus spiritus, cecidit haec toga corporus, quam mox Eliza coniux sustulit et hac in sista condidit, which seems to mean something like 'while his soul flies off to heaven, this mortal gown remains below, and Eliza his wife stays too and waits her time to join him' - but I'd welcome a better translation if anyone wants to have a go. There are two grand late 17th Century memorials either side of the chancel, but it is impossible to say who they belonged to because they are, most unusually, made from plaster which was painted, and the paint has now faded, the names lost. Interesting period peices nonetheless, and along with the brasses suggesting that Chattisham was perhaps a prosperous place in the late 16th and 17th Centuries. There is some good late 19th century pattern book decorative glass in the upper lights of some of the windows, but otherwise the glass is clear, allowing the white light to infuse the simplicity of the furnishings. The royal arms are to George III; common enough, but if you look closely you will see that the lion has been given spectacles! There can be no doubt as to the masculinity of the lion, but rather oddly the unicorn has had his manhood painted out. Perhaps it was by the same person who added the spectacles, but of course we shall never know. A lovely figure of St Margaret carved from driftwood sits in a medieval image niche. Perhaps it should not really be here, because in fact the curious dedication of this church appears to be the result of an18th century mistake. 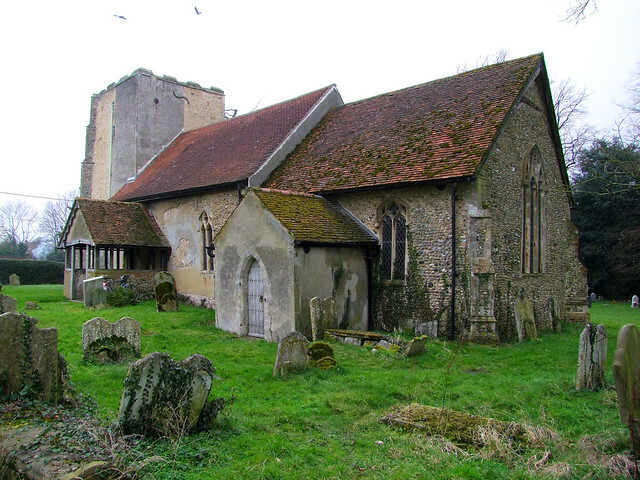 The medieval dedication was to All Saints, but the enthusiastic antiquarians who investigated dedications after their two centuries of disuse confused this village with Shottisham, on the other side of Ipswich. Working from parish records in the cathedral archives at Norwich, they awarded the dedication of Shottisham (St Margaret) to this church as well; when the Oxford Movement in the Church of England restored church dedications to use in the 19th century, the mistake was not rectified, and is now enshrined in everyday use.